NC Senator Brent Jackson (R) received the Marsy’s Law for North Carolina Victims’ Rights Champion Award at his legislative office on April 10th. Senator Jackson served as a primary sponsor on Senate Bill 595/House Bill 551: Strengthening Victims’ Rights and led efforts to pass the proposed constitutional amendment during the 2017-2018 legislative session. The amendment passed out of both legislative chambers with a nearly unanimous vote before being placed on the 2018 midterm election ballot as a referenda item. The Strengthening Victims’ Rights Amendment passed with over 60 percent of the popular vote and will become effective Aug. 31, 2019. The Victims’ Rights Amendment, also referred to as Marsy’s Law, will strengthen the existing rights guaranteed to victims under the North Carolina Constitution as well as ensure their equal and adequate enforcement across all 100 counties. Several rights strengthened by Marsy’s Law include the right to timely notice of court proceedings, the right to be present and reasonably heard at court proceedings, and the right to be notified of the escape, release or parole of the accused. 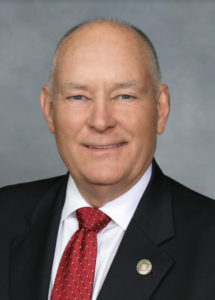 Senator Jackson is a farmer serving his fifth term in the North Carolina Senate. He represents Duplin, Johnston and Sampson counties.